This criterion tells that the effective length of the reactor to accommodate fusing particles (accounting also for the effect of the particular shape of the B field) must be equal to the length traveled by ions. Since the product nT must satisfy the Lawson criterion for ignition, coupling together equations (8.17) and (8.25) in fact constrains the actual length of the fusion chamber in MCF rockets. Not surprisingly, the major factor in scaling L is the extremely high ion energy, E, due to fusion. Since ion speed is high, even short ignition/residence times t mean very long distances traveled while confined. After some calculating, the result is that a mirror MCF propulsion system must have a length, L, many orders of magnitude greater than the bottle cross-section, in practice of the order of many tens, or even hundred, meters. The physics of mirror fusion propulsion seems to result in very thin and very long engine shapes. Whatever their shape, imposing B fields over distances of orders of tens of meters means unfortunately large mass. This implies that superconducting magnets may become critical components/technology in designing practical mirror fusion rockets. One could compact MCF rocket engines by switching from a mirror to a tokamak topology: the length, L, of the bottle is ''turned end-on-end'', and the overall size of the reactor decreases by a factor roughly k. Although it is hard at our stage of fusion knowledge to conceive practical ways of producing direct (thermal) thrust from a standard tokamak, reverse field configuration (RFC) reactors have been proposed (see Figure 8.20) that can embed a tokamak geometry within a mirror propulsion configuration. Combining the best of two worlds, the goal of RFC reactors is to fuse plasma while letting it escape at one end, for instance to the right, in Figure 8.20, to produce thrust. The advantage of RFC reactors is their compactness, similar to that of spheromaks, from which they differ because of the poloidal magnetic field, more intense than the toroidal field (in spheromaks they are comparable). The RFC operating mode is relatively new, so not much work has been done to predict its performance, and especially to estimate its overall size and mass (e.g., Appendix B). Figure 8.20. Sketch of an RFC reactor with neutral beam port. If RCF reactors cannot be made to work as practical thermal rockets, tokamak MCF may be restricted only as electric power sources of relatively low overall efficiency. On-board power generation is necessary in any case for spacecraft, but from the viewpoint of space propulsion, direct propulsion via a mirror bottle looks conceptually a better solution than using a tokamak to generate electrical power. Comparing MCF rockets to ICF, the first obvious remark is that size of the ICF power-releasing chamber upstream of the nozzle is roughly that of the single pellet, i.e., of order of millimeters, much smaller than any mirror rocket. Pellets will be hit one by one by lasers as they are injected inside the ICF reactor chamber. The ICF reactor may be visualized, for instance, as a simple channel, where fuel pellets are injected and ignite. 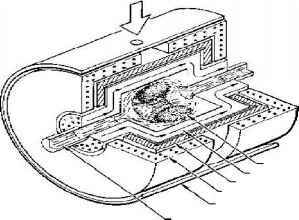 However, the energy released during a single fusion episode (pulse) is so large that the micro-explosion of a fusing pellet must be prevented from damaging the ICF reactor walls. Damage can occur caused by a combination of radiation and conduction heat transfer, plus the effect of momentum deposited on walls by the hot expanding plasma. Unlike steady-state fusion, however, the time over which energy release may damage the chamber will be short: the situation is similar to that in an automotive combustion engine, where instantaneous combustion temperatures may exceed 2,500 K, but the confinement time is so short that cylinder walls may be made of aluminum and may be cooled by water. That situation is paralleled by ICF when compared to MCF. Since d is presumably much greater than Rc then B0 depends mostly on the channel size Rc and on the initial velocity, or kinetic energy, KE, of the exploding pellet plasma. Assuming typical masses and energies of pellets (e.g., for a D-T pellet the mass is of order 0.25 gram), the B field that can prevent damage to the ICF channel turns out to be of order 0.33 tesla, not very intense. This result might be considered counterintuitive: one may think it impossible to have a miniature thermonuclear explosion harnessed inside a channel of a few centimeters diameter. In fact, the mass of pellets considered for controlled ICF is a minute fraction of that in a thermonuclear warhead, and scaling of confinement effects is non-linear. Fundamental physics therefore indicates ICF rockets may work without recourse to exotic technology. On a much grander scale, that was also the conclusion of the Orion Project in the 1950s. The goal of Orion was to drive a spaceship by repeated nuclear explosions a certain distance away from a pusher plate attached to its stern [Dyson, 2002]; this project is apparently being resurrected, although using micro-nuclear explosions. The DPF reactor of Figure 8.14 could, in fact, partially simulate its operation. To summarize this comparison, ICF propulsion needs smaller fusion chambers; its power and thrust will depend on pellet injection repetition rate. Total mass depends most significantly on the power laser assembly, probably the single most critical component. MCF rockets may need much longer reactors in mirror configuration, or more compact ones (perhaps by a factor of 3-4) in an RCF configuration. 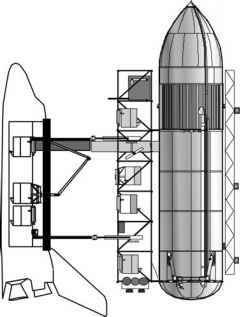 If electric thrusters are preferred, then energy conversion machinery must be added, and thermal fusion power may be two or three times that needed to produce thrust.